A study finds high rate of underdiagnosis of age-related macular degeneration in primary eye care practices and advocates need for improved detection strategies. Age-related macular degeneration (AMD) is the leading cause of irreversible vision impairment in older adults in the United States, yet little is known about whether AMD is appropriately diagnosed in primary eye care. The authors planned this study to examine the prevalence of eyes with AMD in patients seen in primary eye care clinics who purportedly have normal macular health per their medical record and the association of AMD with patient and physician characteristics. This cross-sectional study of primary eye care practices in Birmingham, Alabama, evaluated 644 persons 60 years or older with normal macular health per medical record based on their most recent dilated comprehensive eye examination by a primary eye care ophthalmologist or optometrist. Presence of AMD as defined by the Clinical Age-Related Maculopathy Staging system based on color fundus photography and a masked grader. Of the 1288 eyes from 644 subjects, a total of 968 eyes (75.2%) had no AMD, in agreement with their medical record; 320 (24.8%) had AMD despite no diagnosis of AMD in the medical record. Among eyes with undiagnosed AMD, 32 (10.0%) had hyperpigmentation, 43 (13.4%) had hypopigmentation, 249 (77.8%) had small drusen, 250 (78.1%) had intermediate drusen, and 96 (30.0%) had large drusen. 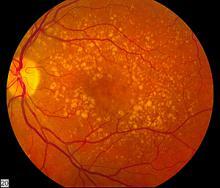 Prevalence of undiagnosed AMD was not different for ophthalmologists and optometrists. One of 4 eyes studied was not diagnosed with AMD in a dilated fundus examination performed by primary care ophthalmologists and optometrists despite these eyes having macular characteristics indicative of AMD. This finding is concerning because 30.0% of eyes had drusen characteristics consistent with intermediate AMD, which is treatable with nutritional supplementation. The reasons underlying AMD underdiagnosis in primary eye care remain unclear. The authors suggested that more specific training in identifying AMD during fundus examination and higher quality retinal imaging modalities should be implemented in primary eye care to allow correct identification of AMD and treatment in the earliest phases, thus preventing avoidable loss of vision. Posted in Age-related Macular Degeneration, Screening and tagged AMD, drusen, macular degeneration, ophthalmologist, optometrist.